Hoppang is a popular hot snack commonly found in Korea especially during the winter season. It is a pre-cooked ball of rice or wheat flour dough filled with red bean paste or other favorites such as vegetable, pizza, curry, and much more. 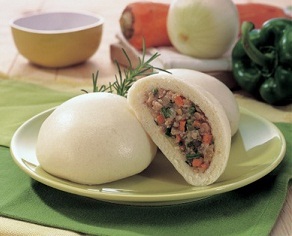 Similar to Chinese Doushabao, hoppang is steamed to keep warm and sold at small food markets or convenience stores throughout the winter months, usually costing less than few US dollars. Outside of Korea, hoppang is usually found in the frozen aisle of Korean supermarkets where each buns can be either steamed or microwaved, ready to be enjoyed within minutes.